This delightful comedy opens as Morris Brown, a New Yorker better acquainted with his checkbook than his prayerbook, returns to Galicia with his very American daughter, Mollie (the incomparable Molly Picon) for a family wedding. The bride, daughter of his traditionally observant brother, and Mollie, whose exuberant antics fill the film, could not be more different. But Mollie unexpectedly meets her match, an engaging young yeshiva scholar who forsakes tradition and joins the secular world to win her heart. 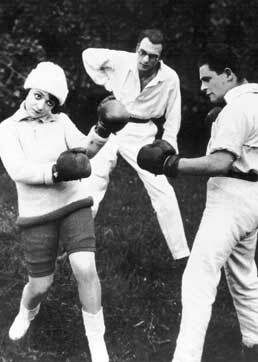 East and West features classic scenes of Molly Picon lifting weights and boxing, teaching young villagers to shimmy and stealing away from services to gorge herself before sundown on Yom Kippur. Underlying these hijinks is veteran filmmaker Goldin's affectionate appreciation of differences, for good-natured comedy shapes his portrayal of worldly Jews encountering traditional shtetl life. "East and West is a light comedy, one of the great number of Yiddish films turned out in the 1920s to entertain an audience on both sides of the Atlantic. With broad strokes and plenty of self-parody, it raises the issue of modernity." "There are many scenes that allow Ms. Picon to shine. With her big, laughing eyes and her Clara Bow mouth, she is most appealing... The film effectively contrasts the lifestyles of the two families and can be used to stimulate a lively discussion about assimilation and Jewish values." Restoration was completed with funding from American Film Institute Film Preservation Program and the National Endowment for the Arts with additional support from Paul Potash.